Universal Century 0087. The Titans, a bellicose faction among the Earth Federation Forces, grows powerful and tyrannical, even using poison gas to suppress a civil unrest. Dissident soldiers from the same military stand against them, forming a resistance group called the AEUG. Kamille Bidan, a civilian student, gets entangled in this conflict when he impulsively steals the Gundam Mark II and joins the AEUG, running away from his home space colony. Then he begins to fight along with Char Aznable, a former Zeon ace pilot who has infiltrated the Earth Sphere for reasons of his own. 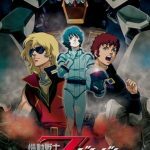 This is the first part of the feature trilogy derived from the anime series Mobile Suit Zeta Gundam, and features enhanced animation and theme songs by GACKT.